According to the International Monetary Fund’s 2019 forecast for Real Gross Domestic Product (GDP) growth, the annual percentage change among Commonwealth countries will be highest in Dominica this year and lowest in Nauru. Of the ten countries predicted to register the highest GDP growth worldwide, five are in the Commonwealth (Dominica, Ghana, Bangladesh, Kenya and Sierra Leone). The average GDP growth forecast for the Commonwealth mirrors the global average at 3.7%. On a regional basis, Commonwealth countries in Asia are likely to grow at an average of 4.3%, followed by member states in the Caribbean and Americas and Africa regions, whose economies are expected to expand at an average of 3.8%. As defined by the IMF, real GDP growth is the most commonly used single measure of a country’s overall economic activity, representing the total value at constant prices of final goods and services produced during a specified time period. Sustainable Developmental Goal 8 (SDG 8) aims to promote sustained, inclusive and sustainable economic growth, full and productive employment and decent work for all. Across the Commonwealth females are more likely to be unemployed than males. 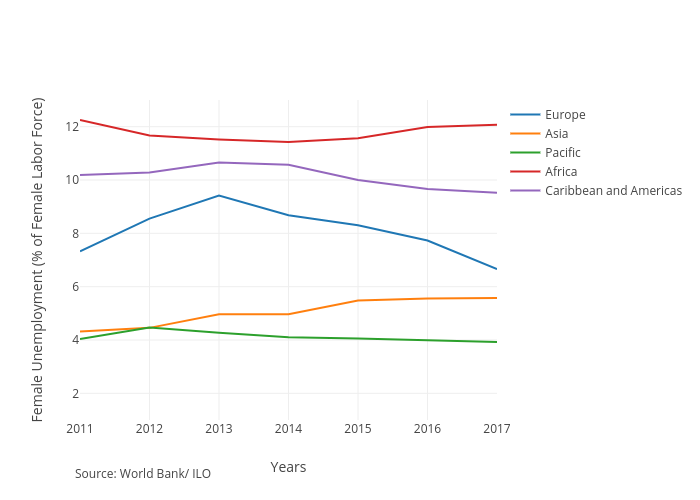 Unemployment data between 2011 and 2017 shows that the disparity between the unemployment rate for females and males was on average greatest in Commonwealth countries in the Africa and Caribbean regions, and least in European member states. Unemployment in this data from the World Bank refers to the share of the labour force that is without work but available for and seeking employment. In the Commonwealth, the average unemployment rate for males was 6.76% while it was 8.74% for females in 2017. From 2011 to 2017, Commonwealth countries in Africa had the highest average unemployment rate for both males and females. 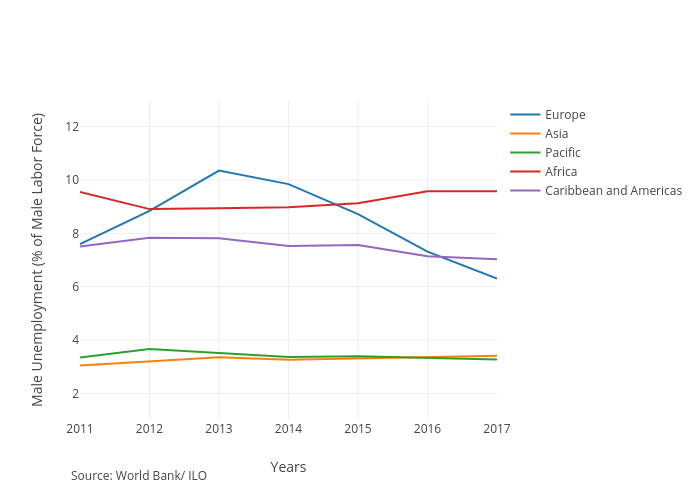 In this period, the male unemployment rate declined for member states in all regions except Asia and Africa (where it went up by 0.12% and 0.003%, respectively). Between 2011 and 2017, the female unemployment rate declined in Commonwealth countries across the regions except in Asia, where it went up by 0.29%. Note: No data available for Antigua and Barbuda, Dominica, St. Kitts and Nevis, Nauru and Tuvalu.